Description: This scene http://www.bryce5.com/details.php?image_id=5182&mode=search rerendered and exported in .hdr format. Obviously not viewable directly as such in this format I then used a combination of calculation and tonemapping (thanks to Horo) to bring the light values back into the visible range for viewing on a monitor. In theory this should offer better quality light capture since it works with the floating point data generated during the rendering process as opposed to the degraded data set offered up to the display in the viewport. This is an experiment. So I leave it up to others to decide if it has been successful. 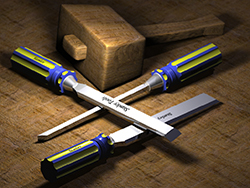 Previous image:	Carpenters Chisels and Mallet. 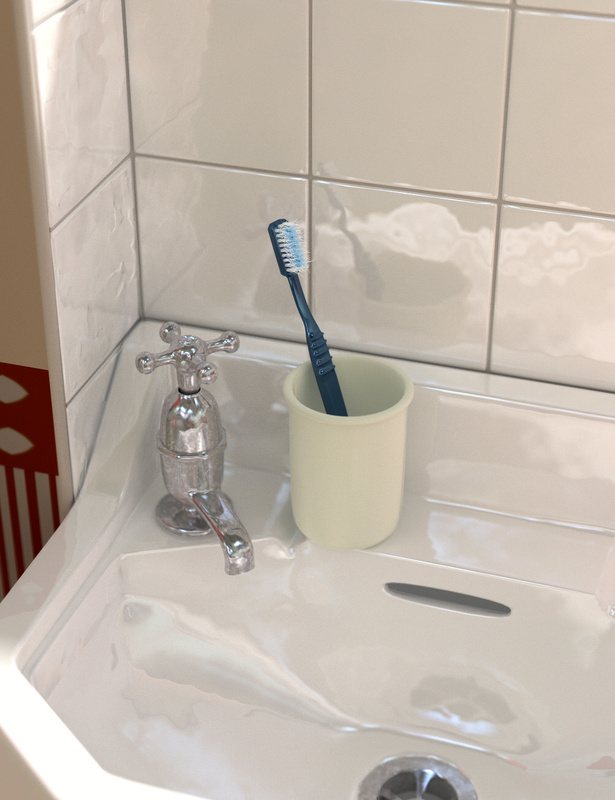 The level of detail is incredible, and it looks like a photograph, how in the world did you make that toothbrush ? I made the toothbrush in Wing 3D. I made a little grid on the face of the brush, bevelled the points of intersection to form diamonds, smoothed the diamonds into circles and then selected all the intersections inside the circles. I extruded those points sightly then randomised them with "crumple" and then extruded them again, and "crumple" adding more and more crumple towards the end. I'm glad you like that effect, it is faffing around to get imperfections that really takes the time and effort. Everything else is too perfect. I'm a lazy modeller really, I soon get tired of faffing. You are welcome, if I get some free time over Christmas I'll try and make some more short Wings tutorials. It's a nice piece of software to use, free and quite intuitive. OR so it seems to me. Nevertheless, excellent visualization. However, the noise is still noticeable. Yes, this could well be mistaken for a photo. I feel like I see some DOF, which adds to the realism a great deal. Picture perfect work, David! Thanks Rashad, Alexey, yes there is a touch of DOF and a touch of noise too. 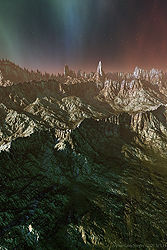 I need either a more powerful PC or some kind person to rewrite the render code in Bryce to negate noise.